What is a box of green coffee? 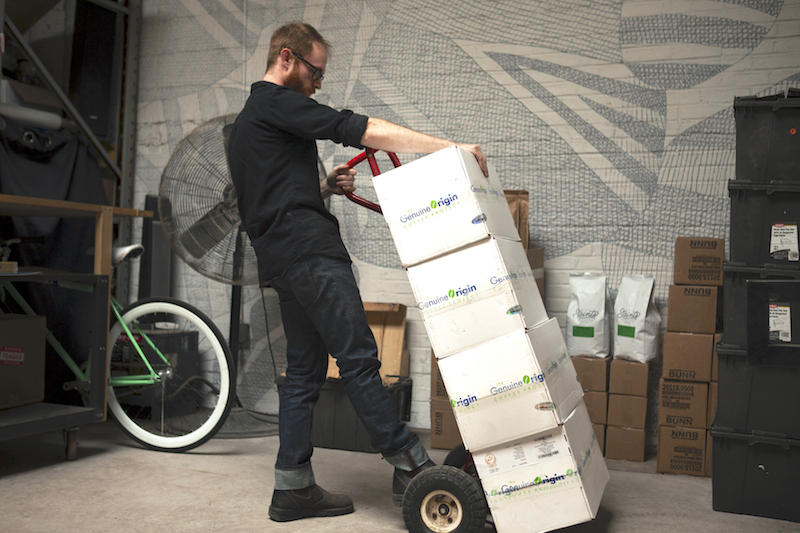 We sell green coffee in 65-lb, GrainPro-lined cardboard boxes with handles, to make green coffee easier to move, store and stack. The boxes are packed and sealed immediately after processing and, stateside, are stored in a temperature controlled, food-grade warehouse in Pennsylvania. 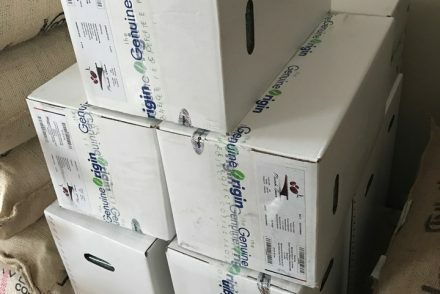 Sample orders, and orders of 9 boxes or fewer, ship UPS Ground from our warehouse in central Pennsylvania, at a rate of $10/box. For orders of 10 or more boxes, orders can be put on a pallet (with or without a lift gate), or can ship UPS Ground. A pallet fits 10 to 24 of our boxes. For either shipment method, shipping drops to $7.50/box on orders with 10 or more boxes. Can I place an order for the future? Yes! You may choose a shipping date up to 90 days in the future during checkout. If you do, your credit card will be automatically authorized for that amount, but this will be cancelled the same day, and we will not charge your card until your coffee has left our warehouse. This is a great way to hold coffee that you know you will want in the future without having to purchase everything up front. It also saves on storage space at your roastery, without you having to pay any fees. What if I need to change the ship date? No problem! Just contact customer service at least 24 business hours before the original ship date, and we can easily change it. An authorization is when a retailer checks to see if an account has the funds available for the requested transaction. It will usually freeze those funds, guaranteeing they will be available when the card is actually charged. If you place an order more than 72 business hours in the future, we will reverse the authorization, unfreezing those funds. Every bank and lending institution is different, and yours may retain an authorization after GO has reversed it, in which case it’s best to contact them. We will re-authorize your card 48 business hours before your shipment date, and charge your card only when your coffee leaves our warehouse. Our coffee is sold On Demand and all transactions require a credit or debit card. Your card will not be charged until your coffee leaves our warehouse. And remember, credit cards offer terms; so, if you place an order the day after your credit card closes, you have up to 45 days until payment is due. Plus, credit cards offer great perks — like miles for trips with GO to great places like Peru and Tanzania. None. Really. We have no storage fee, no loading or palletizing fees, and no taxes. Your price is exactly what you see on the website, which is a static price that will never go up, combined with the flat rate cost of shipping. Unopened boxes of coffee can be returned within 10 business days of delivery for store credit. Please contact customer service, at 646.828.8585 or info@genuineorigin.com, to begin a return. Our discount of 5, 15, or 25 cents per pound kick in on orders of 10, 24, or 48 boxes, respectively, and are automatically applied in your cart. This discount doesn’t just apply to one kind of coffee — you can mix and match different coffees; any combination that gets you to 10, 24, or 48 will get you the discount! If you received a promotional code, there will be a field to enter that code during checkout. Why don’t you sell certified FTO coffees? We usually have one or two certified Fair Trade or certified Organic coffees among our offerings, but we focus more on an internal set of standards called the Volcafe Way. Genuine Origin coffees are sourced by teams at origin that work with producers to implement the Volcafe Way. It’s a system designed to maximize farmer prosperity while ensuring environmental and social integrity (because when farmers aren’t earning enough money to feed their families, it’s hard to talk to them about properly recycling water, for example). For our Volcafe Way program, we hired local people from coffee communities around the world and trained them in things like agronomy and small business planning. They, in turn, provide classes, individual attention and technical field assistance to interested producers in their communities, all at no cost or obligation to the producers. Coma Coffee co-owner Macy Holtzman on a visit, with Genuine Origin, to a coffee farm in Costa Rica’s West Valley. Do you ever bring roasters to visit your operations in coffee producing countries? All the time! We are really excited about the work we’re doing and we want everyone to see it. We take multiple trips throughout the year to a variety of countries. 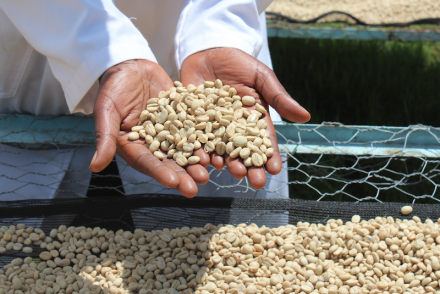 While we require roasters to pay their own airfare, we cover the cost of lodging, food and ground transport during the trip. Can I go on more than one trip with GO? Definitely! Every region is different, and while we do give preference to those who have never travelled with us before, we encourage folks to put their hat in the ring for as many different places as they like. We do discourage individuals from visiting the same region more than once, but multiple folks from the same roaster are absolutely welcome to visit the same region! Have other questions? Think there’s something more we should include here? Please let us know! Email info@genuineorigin.com. *Top photo caption: Jim Osborn, green coffee buyer at City of Saints Coffee Roasters, in New York, receives a green coffee delivery from Genuine Origin.